The Greeks today announced that star warrior Achilles would be out indefinitely with a torn Achilles tendon. The news came as a shock to many Greek fans who believed Achilles to be invincible. The injury, sustained when a stray arrow fired by that skinny little punk Paris hit him in the foot, could potentially be career threatening. Achilles struggled to his feet and limped away into the distance cursing Paris as well as the god Apollo, who he blamed directly for his injury. In a 2 PM press conference an enraged, tearful Achilles swore an oath “upon the throne of Zeus” to be back in time for the playoffs. The news of Achilles injury is another in a long line of stories about the troubled, mercurial but amazingly talented superstar. Achilles has just recently returned from a two month hold out because of The Greeks’ failure to guarantee his war prize and love Briseis in his contract. He also was recently suspended by commissioner Roger Goodell for the flagrant destruction of Hector’s Body and his refusal to return it to The Trojans. Achilles is a wildly popular figure among the fans of the Greeks, but many warriors from around the league have grown tired of him acting like a heel. The major injury to Achilles is part of a rash of recent injuries that have hampered the Greeks. In the past week, several pivotal performers have sustained serious injuries including tight end JerMicheal Finley (hamstring), King Agamemnon (axe through head) and Patroclus (death). The Greeks will be relying on their heavily depleted bench in order to defeat the great Trojan War Machine this Sunday on the frozen tundra of Ilium. Las Vegas odds-makers have moved the line from Greeks by 5 to Trojans by 2 since news of Achilles injury hit the wire. This entry was posted on September 9, 2011, 6:56 AM and is filed under Blithering Sports Fan Prattle. You can follow any responses to this entry through RSS 2.0. You can leave a response, or trackback from your own site. Um… since the Achilles tendon is names after Achilles, should you refer to it as the “his” tendon? I mean, this has wide-ranging implications. How would poor Oedipus be able to talk to his shrink? You can’t study an Oedipus complex until Oedipus has already had it! And think of poor Narcissus, flailing through life trying to describe his over-done self-love complex! Might I suggest a common name as a place-holder for problems utilising a person’s name? Something common, something already in place for things like, I don’t know, bathrooms and customers of prostitutes? Anything? Anything? Bueller? Ha! A valid argument, sir. You just cracked me up! He’s a dead ringer for Pitt. 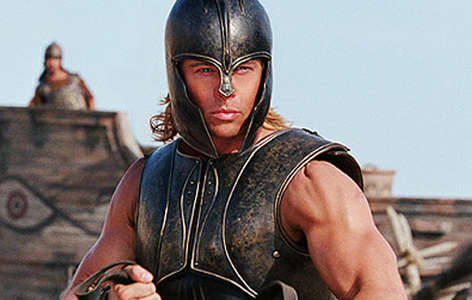 I heard they have offered the role of Brad Pitt to Achilles in the forthcoming “Brad Pitt Story”.